Two Kenyan men accused of stripping a woman in the capital, Nairobi, have been charged with sexual assault and robbery. The attack on 19 September sparked protests, with activists claiming that the woman had been targeted for wearing a miniskirt. The bus driver and conductor denied the charges during a court appearance on Wednesday. They face the death penalty if convicted. Kenya is a conservative society, where activists complain that women's rights are often violated. A video purportedly showing the woman being stripped went viral on social media, triggering a #MyDressMyChoice campaign. Kenya's Deputy President William Ruto threw his weight behind the campaign, saying Kenya was not a "primitive" society. 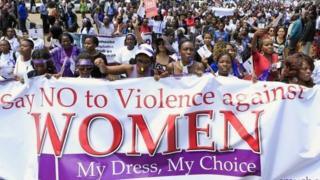 Three other attacks on women, allegedly for wearing mini-skirts, have also been reported in Kenya since September. A police officer has been charged in one of the cases after being accused of trying to rip off the clothes of a woman on a bus.